Explore wild secrets under endless skies. 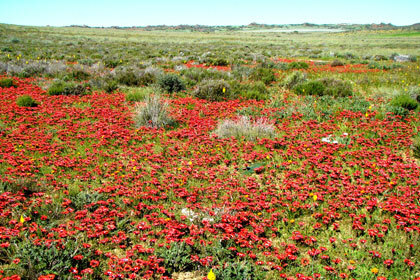 The Garden comprises a vast area of over 6000 ha which includes representative patches of Nieuwoudtville Shale Renosterveld, Nieuwoudtville-Roggeveld Dolorite Renosterveld and Hantam Succulent Karoo. Nine different trails can be followed covering the variety of habitats and soil types which make this Garden so unique and different. The striking Sparaxis elegans, the scented Zantedeschia odorata, the deep-purple Lapeirousia oreogena with its white markings and the yellow and chocolate-brown Hesperantha vaginata. The Garden has two “seasons” that attract visitors. 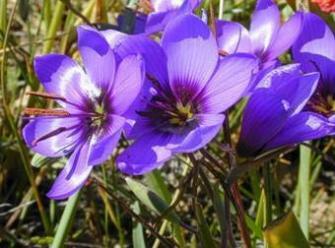 The first and most well-known is the spring flower season that coincides with the Namaqualand flower season. The second less known “secret season” is when the Brunsvigea bosmaniae provides a magnificent and dramatic display during autumn. More than 150 bird species have been recorded on the Garden including the Secretary bird, the threatened Blue Crane, the rare and endangered Black Harrier and the Ludwig’s Bustard. Mammals that occur on the Garden include the second-largest rodent, the Cape Porcupine, the harmless Bat-eared fox and the steenbok. While walking along the Butterfly Trail keep your eyes open for the McGregor’s Blue Butterfly named after Mr and Mrs Gordon MacGregor, previous owners of the farm, Glenlyon, now the Hantam NBG. Oorlogskloof Rd, Nieuwoudtville, Northern Cape, South Africa.